Natahlia, left, Lee and Sally Smith. ONE of the New Norfolk Old Scholars Hockey Club’s most respected players has hung up the gear after almost 40 years and 700 games. Lee Smith, 58, called it a day after playing her final game last Sunday against University at the Hockey Centre in Hobart. Although the team went down 3-0, Lee — or Leeroy, as the goalie is better — played at her usual best, saving many goals as she has done on so many occasions. 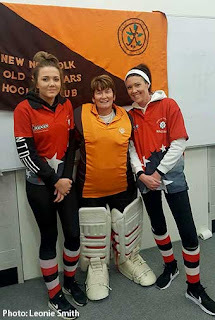 Lee ended her hockey career alongside her daughter Sally Smith (430 games) and 16-year-old grand-daughter Natahlia Smith who was playing her first game with the team. Proving that the veteran still had the right stuff, Lee took out the club best and fairest this season, an award she has won quite a few times before. When asked about grand finals, Lee couldn’t remember exactly how many she had played in. She recalled losing five in a row before the team reversed the tide and won five on the trot. Lee’s most memorable moment came when playing in a premiership with her daughter Sally. “It’s been great to win grand finals, but being in the same side as Sally has been pretty special for me,” Lee said. The pair are the longest serving mother-daughter combination in the club’s 50-year history with 23 years in the same team. What’s more, Lee kept playing until she was five months pregnant with Sally. And Sally, who joined the team at the age of 13, is quite the proud daughter. “Mum would be up with the best of them in our grade and she’s 58!” Sally said. “She hasn’t always been goalie. She was a field player and put her hand up when we lost our goalie. I’ve never known a player to go to goals and be just as good if not better — old Leeroy was a star in both!” Sally said. Lee was honoured with a special presentation at the club’s 50th anniversary reunion at the New Norfolk District Football Clubrooms on Saturday night.